As primary predators of night-flying insects, bats play a vital role in maintaining the balance of nature. A single little brown bat can catch 1,200 mosquito-sized insects in an hour. Bats can be found living in almost any conceivable shelter, though they are best known for living in caves. Many species that now live mostly in buildings do so, at least in part, because they have few alternatives. As traditional roosts in trees and caves have been destroyed, many of North America’s bats have been forced to seek shelter in man-made structures. 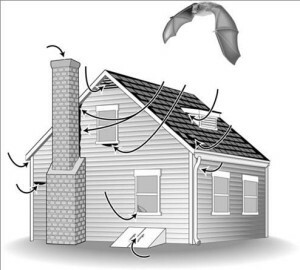 Bats may roost in attics, soffits, louvers, chimneys, under siding, eaves, roof tiles or shingles and behind shutters (see diagram). In sports stadiums and parking garages, bats sometimes roost in expansion joints between concrete beams. They can enter through openings as small as one-half inch in diameter (1.3 cm). Common points of entry include open windows or doors, broken or poorly-fitted screens, loose or missing shingles or tiles, places where flashing or boards have come loose and locations where pipes or wiring enter buildings. Bats can sometimes be detected by the presence of black or brown stains from body oils or droppings around cracks or crevices formed by ill-fitting building materials. Bat droppings may also appear on walls, under porches or decks, or on floors beneath dilapidated ceilings. Bat droppings are dark and do not contain any white material. Although they may resemble small hard rodent pellets, bat droppings are soft and easily crushed, revealing shiny insect parts. When Bats enter and roost in your home or cottage, they can cause significant health concerns and cause damage. Their removal and decontamination requires a high level skill and professional training. If you think you may have Bats, Talk to the trusted professionals at Muskoka Pest Control and arrange an on site consultation and assessment. We can Help!